This popular Italian dish is made with an Arrabiata (spicy) sauce. 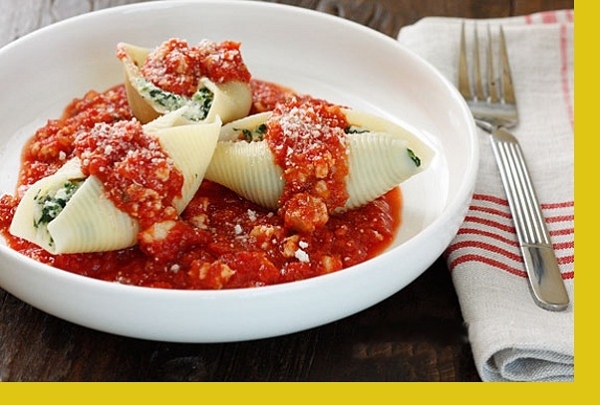 Jumbo pasta shells are stuffed with a mix of ricotta, parmesan, parsley, basil and seasoning. 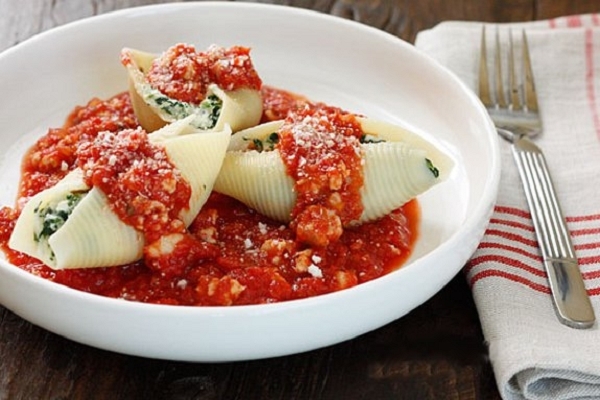 Arrabiata sauce is poured both under and over the shells to make a wonderful "Pasta Arrabiata". Buon Appetito! 1. Preheat the oven to 350F 2. Place the pan of pasta shells in the oven uncovered 3. Bake for 25 to 30 minutes. Such a quick and easy meal since everything came already prepared and all you had to do was pop it in the oven. If you are an Italian lover-this is a no brainer! Very tasty and I enjoyed it very much! Love not having to prepare! My husband and I loved these! The Arrabiata sauce was so fresh and flavorful. After a long day it was so easy to just pop it in the oven. Delicious and easy! The food was fresh, tasty, and easy to prepare. However, my 5-year-old complained it was too spicy. I think she may have been reacting to the acidity of the tomato sauce. Not sure if there is a way to make it a little creamier or offer a creamier option to make the tomato sauce go down a little smoother. I probably won't be able to order this again if no changes are made because my daughter won't eat it and that kind of defeats the purpose. The stuffed shells are very good. It couldn't be more simple to prepare either, which is always a plus. Generous portion which allowed for leftovers. I ate some cold for lunch the next day and they were good that way too. Everyone enjoyed the shells, the only request from everyone was more sauce. I ordered four servings and with my family it was more than enough, very generous portions! Can't beat the convenience of this dish....from fridge to oven. Another one of Maria's tasty dishes. A little more sauce would have been great but was good anyway. Will for sure order again. The arrabiata sauce was so good, and the shells and stuffing turned out great! For those, like me, who don't know what arrabiata sauce is -- it has so much more flavor and a better texture than marinara. We did cook it the full 30 minutes (and our oven tends to run hot), but it was worth the wait. Serve it with a salad to complete the meal.